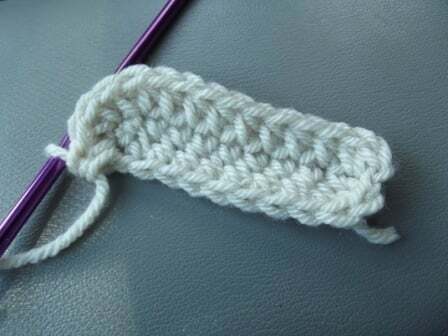 Although it is fairly easy to do, crocheting an oval can be confusing especially when it comes to working into the free loops of the beginning, also known as starting, chains. I know I had a difficult time trying to figure it out when I first came across it in a slipper pattern. In those days I didn’t have access to the internet, nor did I have anyone to show me, so I had to figure it out myself. Thanks to my stubbornness I refused to give up and finally got it right. 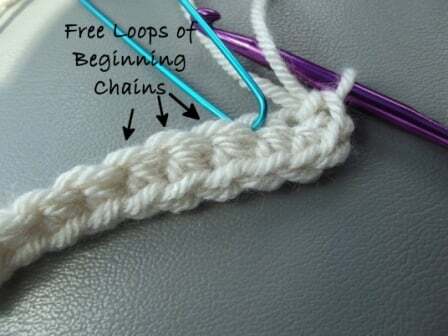 Anyhow, this tutorial will show you how to work into your beginning chains, how to turn the round and crochet into the free loops of the beginning chains as well as brief instructions on how to join the round. 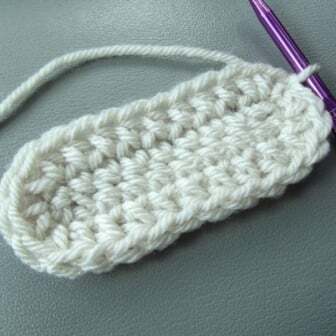 The intent of this tutorial is just to show you the basics of how to crochet the oval by following a pattern. I made even increases on both ends, however, other patterns might have more increases on one end than the other. Slippers are an example of when you might have more on the toe end than on the heel end. After the first round you can begin to shape to ends into sharp corners to create a rectangle or leave it oval. Some of the things that require an oval shape are oval rugs, the bottoms on bags and slipper patterns. Step 1: The first step is to make a chain. This can be any number that you want or as specified by the pattern. 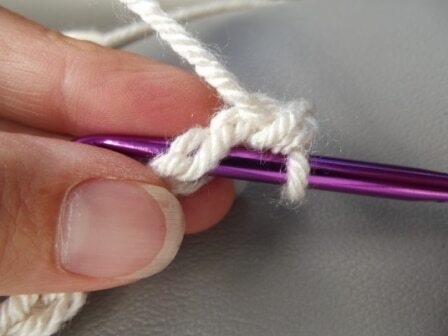 If you insert your hook below the center loop, you will have two loops on top and one on the bottom. And vice versa. The images below show what it looks like when inserted below the center loop. Be consistent in whatever method you choose or you might end up with a funny looking edge. 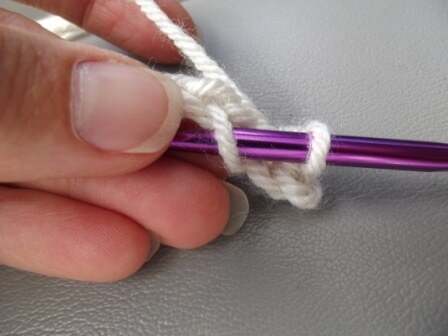 For single crochet stitches work your first stitch into the second chain from the hook. With double crochets you would work into the third or fourth chain depending on whether the skipped chains count as a stitch or not. 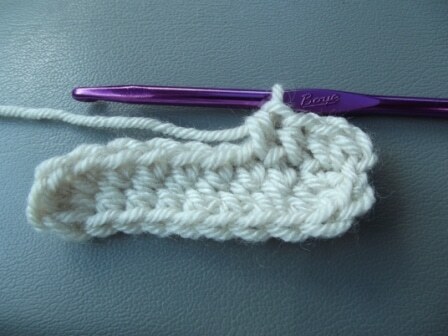 The image below shows the single crochet made. You might want to mark this stitch so that you know exactly where to join it later. Single across to last chain. 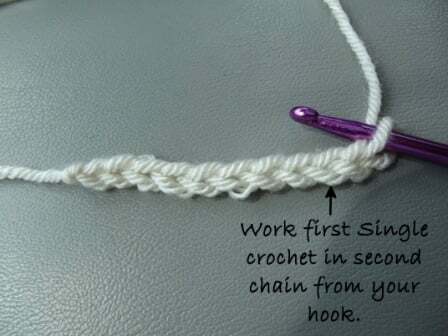 Now depending on the pattern, you might crochet anywhere from 3-5 (or more) stitches into the last chain. 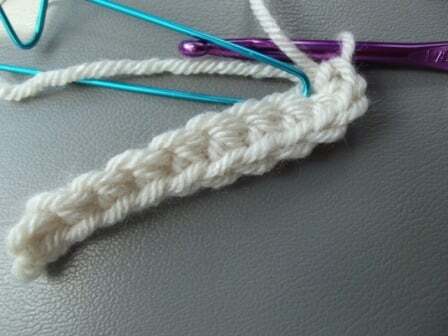 Then the pattern will tell you to turn your work and crochet into the free loops of beginning/starting chains. What I like to do is make my turn halfway through working the end stitches. In this case I will be working 3 single crochet stitches into the last chain. 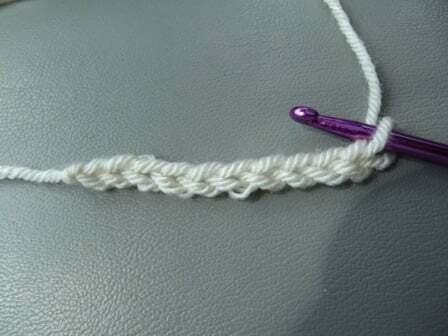 Since you can’t divide 3 in half, I make my first 2 stitches in the last chain. Here you can see my first 2 stitches are made in the last chain. Then I basically turn my work upside and finish off the remaining stitches, which in this case is 1. It’s hard to tell, but there are 3 stitches made in the last chain. 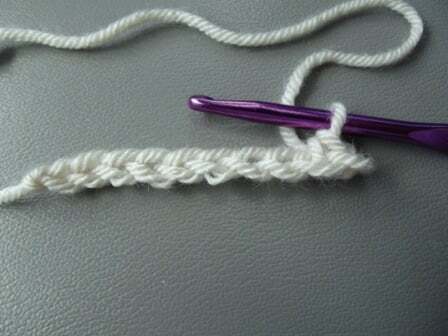 At this point you can begin to crochet over your tail end so you don’t have to weave it in later. Now you are ready to work into the free loops of the beginning chains. 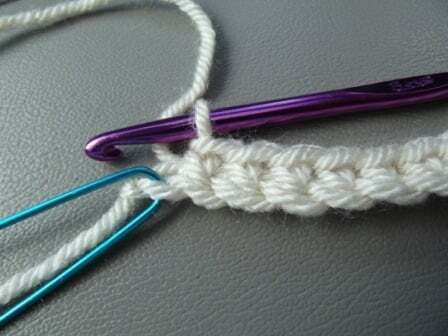 The stitch marker is moved to the first free loop that you need to work into. 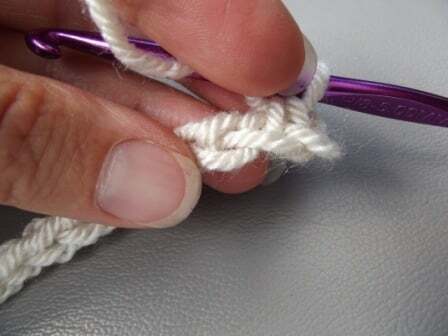 Continue to single crochet into each free loop of beginning chains up to the last loop. Patterns will vary at this stage, but in this case you will work another 2 single crochet stitches into the last free loop. That way you have 3 stitches on each end. The last 2 single crochet stitches made. 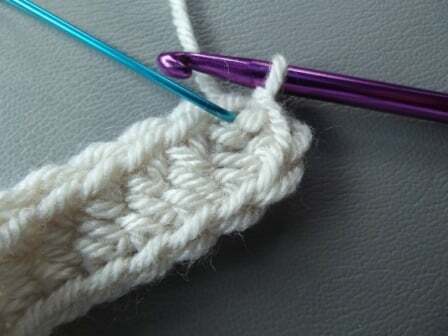 Your next step is to join the last stitch to the very first single crochet stitch that you made in the round. 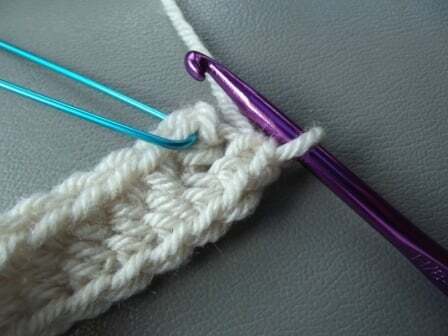 Click here for a tutorial on how I make my joining slip stitch. 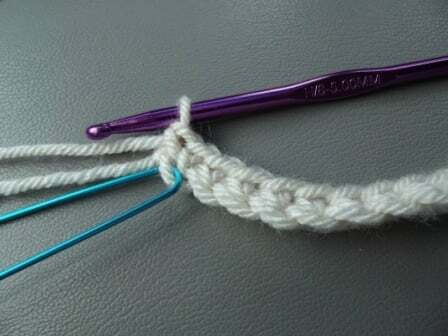 Basically, insert your hook into the first stitch, yarn over and pull through. I like to pull my slip stitch nice and tight in order to reduce the appearance of a seam. Then begin your next round as the pattern instructs. 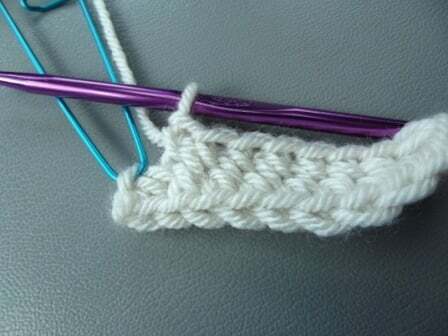 In this case I worked 2 half double crochets into the first stitch. Then worked in an even pattern to the next end. 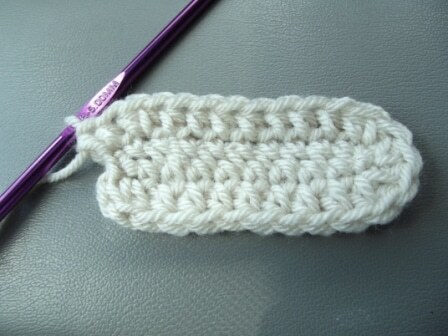 Once at the other end I made another 3 increases by working 2 half double crochets in each of the 3 end stitches. Once again, work your stitches evenly across up to the last 2 stitches. Then work 2 half double crochets into each of the last 2 stitches. Now you’re ready to join the second round with a slip stitch the same as you did for the previous round. Continue following the pattern and make your increases at each end as instructed by the pattern. This is the best tutorial/instructions I’ve found on oval shapes (and I’ve looked at a few!). Now i understand *why* I put the stitches in certain places instead of just trying to count blindly. Thank you so much for making this available! This is awesome! I started an Afghan this way but how do I square it out? I’ve been doing 3 D.C. In each corner and it’s not quite squaring out it’s more like an oval with edges. Hi Stacie, You would need to do at least 4-5 dc in each corner to make it square. Completely odd question. Are you taking the pictures on the seat of your car? It’s just something I would do. Picking the girls up from school, I have to be there 30 minutes early to get a parking space, bored out of my mind and I think – Hey let’s do a tutorial. Yes, I did several in the car.. had better lighting out there lol.